Nearly every firm has clients who are difficult to collect from. Most lawyers are not trained to deal with that. 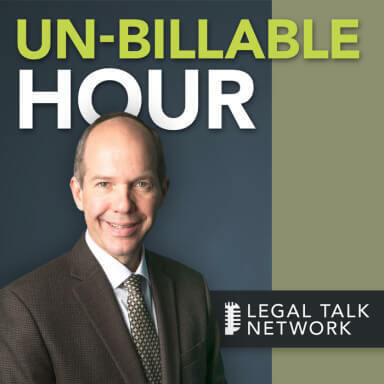 On this episode of the Un-Billable Hour, host Chris Anderson interviews experts Loretta Ruppert and Jeff Krause. Together, they explore ways to effectively track and manage client billing. Loretta Ruppert is the current Senior Director of Marketing for the SaaS Product Platform at LexisNexis. She is the subject matter expert for billing and accounting software solutions, including Time Matters, and has been involved in developing software products for law firms for nearly twelve years. She is a current member of the American Society of Women Accountants and the former Controller for the Bliss Riordan Law Offices. Jeff Krause is a Wisconsin attorney who founded Krause Practice Management, LLC and is a founding partner at Solfecta, LLC. He is a Certified Independent Consultant for software solution Time Matters and a frequent author and speaker on legal technology.